In July 1995, Barnes & Noble opened a 25,000-square-foot superstore in Portage, MI, on a suburban strip teeming with mall complexes and fast food chains. Coexisting among the global brands were a number of independently owned businesses, including John Rollins Booksellers, a much-loved local outfit. Rollins had moved to Portage in 1986, fleeing a withering retail climate in its original location, downtown Kalamazoo. By the time Barnes & Noble set up shop—literally across the street—Rollins had expanded to 13,000 square feet and stocked 80,000 titles. I was a longtime Rollins devotee—its Kalamazoo store was the first bookstore I remember being in—and feared Barnes & Noble would extinguish not only it, but all independent bookstores in the area, including the Michigan News Agency, where I was then employed. Nevertheless, as someone who loves books in virtually any context or quantity, my resolve slowly faded, and sometime that fall or winter, I paid my first visit to a Barnes & Noble. I walked around for a moment, feeling oddly guilty, then left without buying anything. My boycott didn’t last long. Here’s how it is with me: Whenever I show up at a place with books for sale—superstore, indie, thrift store, library basement, street vendor—more than half the time, I’ll leave with at least one. And I go to bookstores at least twice a week. I’ve bought new titles in hardcover, then again in paperback; I’ve bought used copies of books I already own so that I can have all the different covers (in this way I acquired three copies of Charles Portis’s Masters of Atlantis); often I stand gazing at the hundreds of books on my shelves, thinking a single, urgent thought: I need more books. Now and then I’ll make a vow to shop only at independents. I usually stick to it for a month or two. Then I’ll find myself at, say, Barnes & Noble in Union Square (where I will have gone to kill time before meeting a friend), surrounded by “browsers” who’ve practically set up shantytowns in the aisles, pondering a Michael Connelly paperback and deciding, finally, that I must own it. 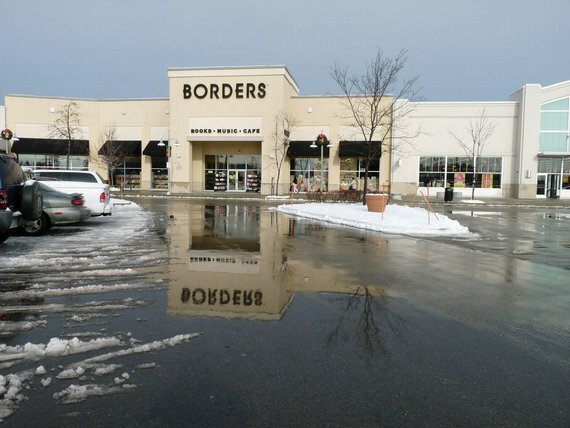 In years past, Borders was a sanctuary for me, a place to flee the boredom and disappointment of the various office jobs that prevented me from writing my own stuff. Being among books for an hour or more (I was never a model employee)—touching them, leafing through them, and, yes, buying them—helped me to regain a tenuous equanimity and get through the mind-numbing afternoons. It was largely a coincidence of geography that Borders served this purpose. I worked in the World Trade Center for the last year and a half of its existence and went to the Borders in the Five World Trade complex several times a week. After 9/11, I found myself back downtown—another cubicle, another unfulfilling job—and sought refuge in that store’s replacement, on lower Broadway (I also frequented the Strand’s Fulton Street Annex, now defunct). In 2007, I landed uptown, in the most soul-killing corporate office I’ve worked in. By the end of my first week I was roaming another Borders, on Fifty-seventh Street and Park Avenue. There was another reason why I was drawn to Borders and happily spent so much money there—the chain, like me, is from Michigan, a state whose economy you may have heard something about. I’ve been to its original store in Ann Arbor many times. So, even on Park Avenue, in one of hundreds of Borders locations worldwide, there remained a dim sense that I was supporting a “local” business. For all these reasons, I was unaccountably depressed when I learned not only that Borders had filed for Chapter 11 protection, but that the list of stores set to close as a result included two of my former havens—lower Broadway, and Fifty-seventh and Park. Is it odd to mourn the closing of certain big-box stores? You could argue that Borders brought trouble on itself, that after years of outrageous expansion, partnering with Amazon, and failing to keep pace with the rise of e-readers, it deserves whatever it gets. Intellectually, I might agree with you. But as the author of three books, I have an emotional stake in this too. I’d be lying if I said I wasn’t ecstatic the first time I saw my book at a superstore. No less than seeing it on the shelf of one of New York’s great indies, this signified “making it” to me. Over the years I’ve heard from a fair number of readers who tell me where they first encountered my books. Often they mention one of the big chains. These are actual human book buyers, not numbers in a newspaper article about the death of publishing, and some of these book buyers, I gather, are writing from places where a chain store in a mall is the only game in town. On the other hand, I’ve developed the kinds of relationships with store owners and staff at independent bookshops that aren’t possible at a chain. Three Lives & Co. in New York, to name just one, has given my books crucial store exposure and word-of-mouth support. It also offers something that would seem like a no-brainer but that no superstore provides: a deeply pleasurable browsing experience. It’s one thing to seek out a public restroom, or to prefer a certain bookstore to your cubicle. Abandoning yourself for long stretches to the sensuous art of aimless browsing is quite another. As a reader and writer, the current moment is endlessly confusing to me. Sometimes I feel like I’m on a one-man mission to save publishing, buying books weekly from indies and chains alike, for the sake not only of my future work, but that of future writers, young people far from urban centers, dreaming up stories in Texas or Idaho or Michigan. When I was teenager I spent hours at John Rollins Booksellers, fantasizing about one day seeing my own book for sale there. By the time my first one came out, it was too late. Rollins tried to compete with Barnes & Noble, opening a second, hangar-like location with a cafe across town. That store closed in early 2000, and the Portage store followed soon thereafter. The Michigan News Agency, however, is still in business, as it has been since 1947. They carry a wonderful selection of new paperbacks and a staggering number of magazines. Stop by if you’re ever in Kalamazoo. Bryan Charles is the author of the novel Grab on to Me Tightly as if I Knew the Way, and Wowee Zowee, a book about Pavement written for Continuum's 33 1/3 series. His memoir There's a Road to Everywhere Except Where You Came From was listed as one of Library Journal's best nonfiction books of 2010. For more information visit theresaroadtoeverywhere.tumblr.com. In its never-ending roll-out of new features and incremental redesigns, Amazon has introduced “Author Stores,” which Amazon calls “new corners of our bookstore dedicated to offering customers a new way to browse and shop favorite authors, discover new books, and more.”Basically, Amazon has created dedicated pages for several hundred authors. It’s a nice little navigational upgrade since it is sometimes difficult to get a sense of an author’s oeuvre using Amazon’s search, though for Author Stores to be a truly useful navigational tool, Amazon would need to create them for many thousands more writers.The Stores themselves are moderately interesting. At their most bare bones, Sherman Alexie’s, for example, the Stores offer just a list of the books the author has written. Stephen King’s, on the other hand, offers more substantial diversions including a video of the author himself. It will be interesting to see how much Amazon expands these stores and whether the features Amazon promises to add “in the months to come” will be genuinely unique or just more repackaging of content.Meanwhile, LibraryThing’s author pages are far cooler, with lots of meta-data and interesting tidbits supplied by LibraryThing’s active community. By way of comparison, here is David Mitchell on LibraryThing and on Amazon. Economic, political and social violence are senseless, and render us unable to tell neat linear narratives about injustice and protest. This resonated with me, as I was just in a closing Borders yesterday (very depressing) thinking many of the same things. While it may seem silly to mourn the loss (or at least the eminent loss) of a giant chain, I can’t help but associate my local Borders with pleasant reading memories. Browsing for books is such a meditative experience for me, and much like the author of this article, Borders has always been a haven for me when I’ve been stuck in the doldrums of mind-numbing office jobs. I can look at almost any book on my shelves and remember where I picked it up; each physical copy contains a surprisingly vivid memory of my surroundings when I found it. It’s a real bummer to realize how rapidly the places that led me to great books are disappearing. Yes! I do exactly the same thing! I buy books wherever and whenever I can. A couple of books each & every week, minimum. I probably could’ve bought myself a whole bookstore by now, just from the money I spend on books. I know eBooks are the future, & I’m OK with that, but OH! There’s just something so glorious, so absolutely glorious about holding a book in my hands; to smell it, to feel it, to hear the sound of a page as I turn it. Thank you for reassuring me I’m not the only one who still buys real books. Because now when I find myself surrounded by all the Kindlers, Nookers, eReaders and iPadders of the world, I think I’lll feel less of a luddite and will stand a little taller. Bryan, I loved your first novel! And this well written piece led me to the B&N on Court St in Brooklyn where a very helpful staffer found Road to Everywhere in the Biography section, where I got the last copy (shelved next to Chabon’s Manhood). I picked B&N over BookCourt (which is closer and I love oh so much) because I had a coupon, but finding your book that way gave me hope for B&N, that this model sometimes work out well. Thanks for the good writing. Bryan, thank you for highlighting my Michigan News Agency in downtown Kalamazoo, Michigan. I especially liked your comment that we carry a wonderful selection of new paperback (17,000 different titles) and “a staggering number of magazines”. We are up to 6,800 different choices. I am still dedicated to the concept that lots of readers want to hold the book or magazine, mark it up, and return later to refresh their thinking. AND the on-going selling of your THERE’S A ROAD TO EVERYWHERE EXCEPT helped the Michigan News have a great holiday season! Thanks–The Millions–for your great work. The irony in all this is that in striving to be bigger and better Borders put a lot of smaller bookstores out of business that would have a better chance of survival in the current environment. Say Fidone, how do you lend/share a kindle book with a friend? Ebooks are only part of the future…at least I hope. Premium content is so watered down these days, it’s like, why do we even get out of bed in the morning? A few months back there was some fuss about Penguin selling, for close to $8,000, the Complete Collection: More than 1000 of the Greatest Classics. Recently, used bookstore owner Jeff Sharman went through his inventory and found “a handful of forgotten Penguin Classics” – ones that didn’t make the cut. He raises an interesting point that not all classics stand the test of time. In the back of the winter issue of n+1, you’ll find both a revised version of the defense of literary weblogs I posted here last spring and a response from Marco Roth. It speaks well of the magazine that it would publish dissent as well as invite it (which is also, of course, a hallmark of the “lit-blog.”) And, as I’m still doing my best to puzzle out some of the pros and cons of this new and evolving medium, I thought I might call your attention to an object lesson: the debate over B.R. Myers’ review, in The Atlantic Monthly, of Denis Johnson’s Tree of Smoke.It’s often a blessing that comment-thread controversies blow over without getting wider notice. Ideas that seem vital one week may seem irrelevant the next. But in my view, the conversation developing around Myers and Johnson – at Rake’s Progress, at The Beiderbecke Affair, and now at Ed’s place – illustrates some of the positive critical capacities of the medium.That conversation began in the kind of intemperate name-calling n+1 might deride – “B.R. Myers is Satan”; “Who’s the Wanker?” – but it has broadened to encompass a number of substantial controversies – the responsibilities of the reviewer; the state of American fiction; politics and the English language. And it has helped me better understand Denis Johnson’s prose style.When I read, and enjoyed, Tree of Smoke in June, I felt that its style was both an asset and a liability. Certainly, Johnson is an unusual stylist. And yet, when the first reviews and blurbs began to appear, I was surprised at how little attention was paid to his diction and syntax. “Prose of amazing power and stylishness,” Philip Roth said, without bothering to explain how or why. Jim Lewis’ piece in The New York Times Book Review amounted to a bizarre kind of abdication. Only John Jeremiah Sullivan, writing in Harper’s, engaged with Johnson at the level of the sentence.In my own review (which I’m embarrassed to note also references n+1; this is turning into a bad habit), I attempted to account for what I felt was Johnson’s wide margin of error. “Though there are passages and even pages through which I itched to run my workshopper’s pencil,” I wrote, “I would trade a dozen finely calibrated domestic comedies for a single chapter of Tree of Smoke. [Johnson’s] sentences and dialogue, flirting with the poetic, violate the canons of understatement. Like the sentences of D.H. Lawrence, they seem to depend on the supernatural for inspiration. They may not always find it, but they are alive to the possibilities of language.To his credit, B.R. Myers, too, would pay attention to Johnson’s sentences. Regrettably, he would pay little attention to anything else (the context in which those sentences appear, for example). His review does make a couple of copy-editorial catches: Would Buddhists think of their own icons as “bric-a-brac?” Can “someone standing in […] a noisy place hear even his heartbeat, let alone his pulse?” In never moving beyond fastidiousness, though, Myers’ Atlantic review takes on the flavor of agenda-driven cherry-picking. It attempts to persuade us, by fiat, that a sentence such as the novel’s first – “Last night at 3:00 a.m. President Kennedy had been killed.” – is bad.Critiques of Myers’ motivations and methods are abundant elsewhere; I won’t rehearse them here. But I wanted to point out what lit-blogs managed to do with that last sentence, which hadn’t been done elsewhere. In an anonymous comment at The Beiderbecke Affair (anonymous because overheated and not fully thought through), I wrote: I like the way that pluperfect “had,” strategically ungrammatical, sets us up to expect something to happen in the imperfect. Something has happened, the sentence tells us. Yes, Kennedy has died, but something else…something, presumably, more personal. Thus does the book announce (quietly) its aspirations to be something more than the settled history Myers – a myopic literalist – seems to wish it was.Then a commenter named Alan (who disagreed with some of my bloviations), suggested, This is quite right. Kennedy died at 1 PM US Central Time, which would have been 1 AM in Vietnam. So the sentence “Last night at 3:00 a.m. President Kennedy had been killed” is not actually trying to say that Kennedy died (perfect tense) at that time. That wouldn’t make sense. What the sentence is doing is evoking the experience of a character who is awoken in the middle of the night in Vietnam to the news that Kennedy HAD BEEN killed. This narrative immersion in a character’s point of view can also be seen in the following passage… Alan’s comment is, I think, a small but meaningful exemplar of the critical capacities of an interactive medium, and of what close-reading actually does. Were this a seminar (which, at its best, the comment-thread approximates), the instructor might be saying, “Yes. Yes!” Rather than dismiss an unusual sentence, Alan moves from a puzzle over its meaning (centered on the verb tense) to an intuition (we’ve been thrown, without comment, deep into a character’s point of view) that illuminates an important part of the formal architecture of the whole work.One wants only to add that a serious literary essay has at least two possible registers of persuasion. It can persuade those who haven’t read the book, and then it can persuade those who have. I often feel that Myers is addressing himself almost exclusively to an audience that hasn’t read the work under review, and that his aim is to convince them not to bother. Like Myers, I’ve been disappointed by Annie Proulx and Rick Moody in the past. But, having read them, I’m troubled by the gap between my experience of their work and the experience of their work Myers constructs. A good-faith critic should aim to write an essay that can be revisited after one has read the work and that will not then seem to collapse into flatulence. I admire this about James Wood. His essays are attempts to understand, rather than attempts to seem in-the-know, and they challenge me even when I disagree with them. In this way, he, too, offers a model of what literary discourse on the web can be. On the other hand, the valuable lit-blog conversation about Tree of Smoke seems to have arisen despite, rather than because of, the merits of B.R. Myers’ remarks in print.